Thank you for attending Ignite Burlington 2013! Another incredible Ignite Burlington in the books. Stay tuned – we’ll be releasing video of the speakers over the next few weeks! Want to speak at Ignite Burlington 2014? Email us at info@hergenrotherfoundation.org! Click here for Ann’s speaker spotlight. Click here for Tom’s speaker spotlight. Click here for Ela’s speaker spotlight. Click here for Kevin’s speaker spotlight. Click here for Nathalie’s speaker spotlight. 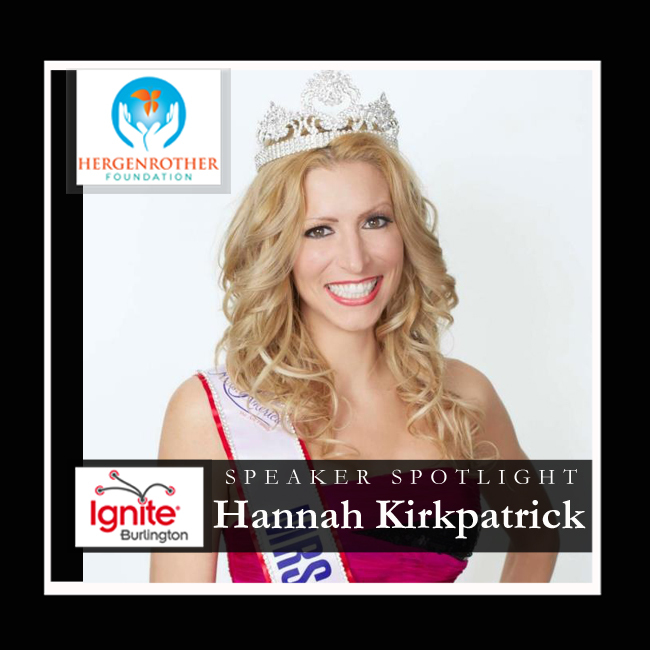 Click here for Hannah’s speaker spotlight. Click here for Janet’s speaker spotlight. This entry was posted in Ignite Burlington and tagged aaron fastman, adam hergenrother, ann zuccardy, david hill, ela wojtowicz, hannah kirkpatrick, hergenrother foundation, hergenrother industries, ignite burlington, ignite burlington 2013, ignite vermont, janet smith, kevin pearce, kim negron, nathalie kelly, new breed marketing, remn, the crash reel, tom murphy on October 25, 2013 by Hallie. Presentation: Recovery ROCKS! Hope & Joy on the Flip Side of Addiction…and How Anyone Can Have It! Disregarding social expectations to “keep up appearances”, Mrs. Vermont America 2013 Hannah Kirkpatrick is a fearless and vulnerable storyteller, willing to expose her journey through the deepest caverns of depression and addictive substances & behaviors, and her close-call victory over some of the same struggles that haunt millions of Americans. Through her story of devastating loss and second chances, Hannah paints audiences a vivid picture of the light at the end of the long tunnel of addiction, affirming that immeasurable laughter, meaning, and hope await on the other side. She brings levity and humor to an often heavy subject, easily delighting audiences into recognizing and embracing their weaknesses, challenging them to support others through dark times, and above all, passionately supporting listeners to take the steps of courage required to ask for help in whatever area they may be struggling. Hannah is an acclaimed speaker and mentor, traversing New England and beyond to inspire students, parents, and general adult populations toward the promises of hope & joy in recovery. 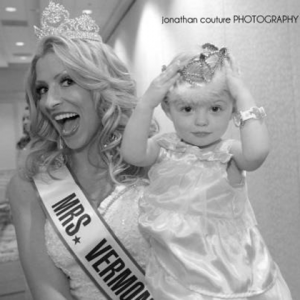 As a capstone to her year of service as Mrs. Vermont America 2013, she made history as the first Vermonter to ever place in the Top 15 at the Mrs. America competition! She credits the irony of telling an “ugly story in a beautiful dress” as her ticket to success. Hannah also coaches women in Africa to economic freedom through entrepreneurism, and offers a personal development & leadership curriculum to individuals and companies looking to incorporate vintage values into their personal lives, families and businesses in a new way. Hannah is incredibly grateful to have her husband, Chris Kirkpatrick, still by her side, and they are delighted to have a “very two” year old daughter named Knightley. This entry was posted in Ignite Speaker and tagged adam hergenrohter, burlington vt fall events, burlington vt october events, hannah boucher kirkpatrick, hannah kirkpatrick, hannah kirkpatrick inspirational speaker, hannah kirkpatrick recovery advocate, hannah kirkpatrick recovery advocate and inspirational speaker, hergenrother foundation, ignite burlington, ignite burlington 2013, ignite burlington vermont, ignite vermont, ignite vermont 2013, mrs. vermont 2013, mrs. vermont america, mrs. vermont america 2013, mrs. vermont hannah kirkpatrick on October 7, 2013 by Hallie.